If you haven’t been following along lately, let me get you caught up quick. The Tinkerer set up aliens to come to the planet and the only way to stop them was with time travel. If they go back to one of the Tinkerer’s first bank robberies, they would be able to get the plans to stop the alien invasion..... somehow.... So, the individuals tasked to help stop the invasion were Teresa (a spy), J Jonah Jameson, and Spidey. When they travel back in time, they enlist the help of a young Nick Fury and rookie teenage Spidey to help them get the intel to stop the invasion in the future. But old JJJ talks to young JJJ who outs Spidey’s identity to the Green Goblin by accident. So, the Green Goblin captures Aunt May and young Spidey in order to kill them and ruin their lives. They stop Goblin, Aunt May finds out Peter’s Spider-Man, and we also find out that Theresa ( the spy) is actually Peters long lost bio-sis. Just pure craziness! 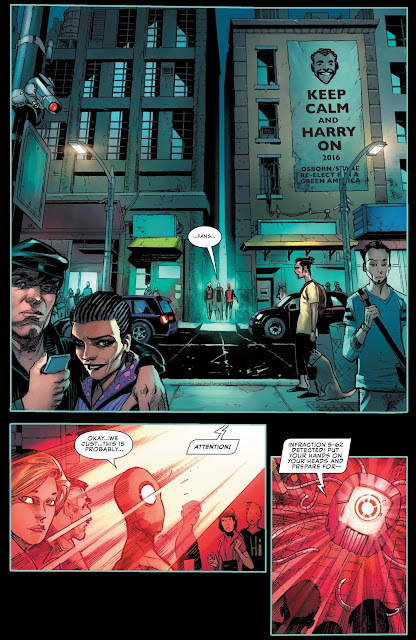 So in THIS issue JJJ, Theresa, and Spidey go back to the future to find out that’s it’s totally different. Turns out, Peter stopped being Spider-Man. His encounter with his older self and Goblin set him over the edge to retire, which led to Norman controlling everything, Harry Osborn as President, and the disbandment of Super-Heroes, villains captured, and many Villains and Super Heroes alike working for Osborn with Octobots acting like police robots. JJJ, Theresa, and Spidey see a Parker Industries building in the distance and go to ask for help and to see what’s going on! They find Peter Parker there married to Gwen Stacey! Now, brace yourself before you freak out about how this is possible, I think Chip ( the writer) is playing off the time travel idea that the travelers are jumping from alternate timeline to timeline. If I suspend my belief of that, it’s a really cool story. 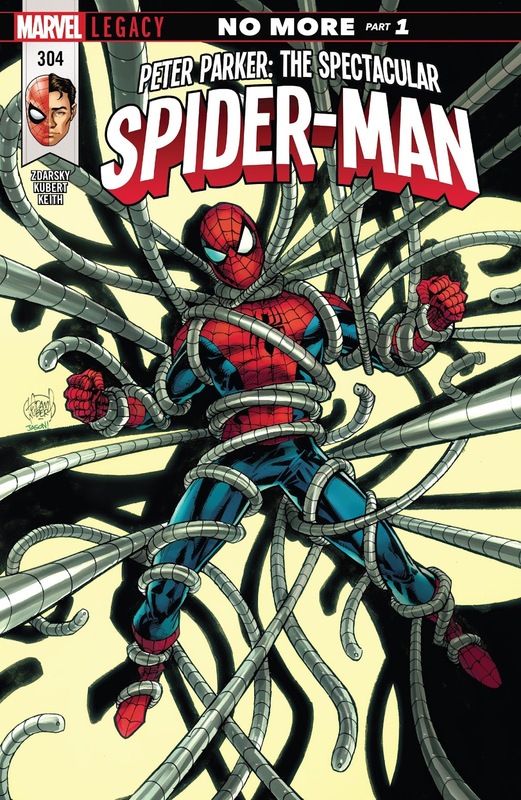 Chip can write the humor of Spidey well and has created a very interesting story over the past 6 issues. He’s given us throwback team-ups to the old Amazing Spider-Man, the old Green Goblin, and Doc Ock while creating brand new ideas for characters like a Venomized Ben Grimm, a sister for Peter, and an Aunt May that knows Peter’s Spider-Man. 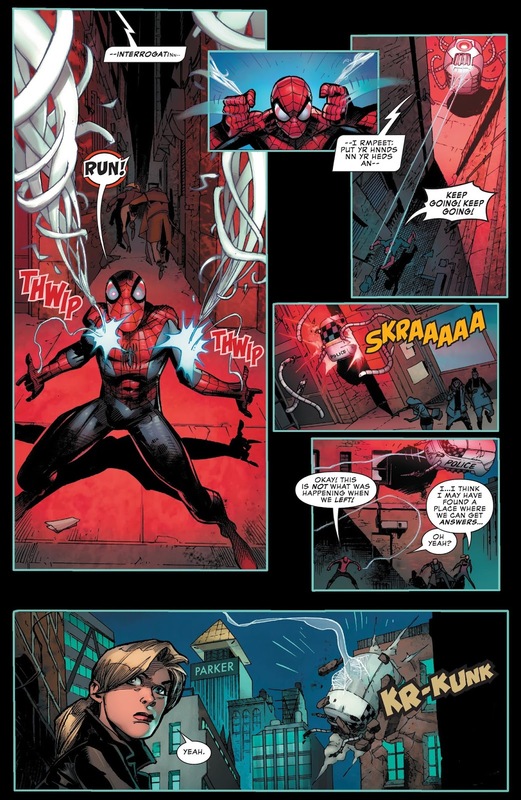 I hope we can find a way of keeping this “outside of time” Spidey. I think that would be cool. But, I’m sure it will all get fixed somehow. The art is fanatic and does a great job paying homage to the old Amazing Spider-Man while interesting key new elements to the characters. Pick this book up! I have no doubt you’re gonna love it!